A 29-year-old Asian male presented to the emergency room with history of fever and chest pain for one week followed by sudden collapse. On examination, the patient had a weak pulse with tachycardia, low blood pressure and decreased air entry on the right. A portable chest radiograph performed at the time of initial presentation demonstrated a large right pleural effusion with suspicion of mediastinal air. Emergency CT scan of the chest was immediately performed to evaluate the cause of pleural effusion and sudden deterioration of the patient. 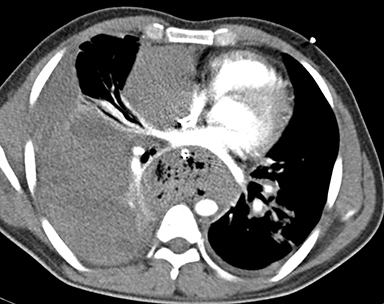 The CT scan demonstrated a large right hemothorax with atelectasis of the underlying lung (Figures 1-3). There was also a small left pleural effusion with areas of consolidation in the left lower lobe. A heterogenous collection of air and fluid was identified in the posterior mediastinum displacing the heart anteriorly, suggestive of mediastinitis/ mediastinal abscess (Figures 1,3). There was a 7 x 5 cm pseudoaneurysm arising from the proximal descending thoracic aortic just distal to the origin of the left subclavian artery (Figures 2-4). A 3 cm linear radiopaque density was identified adjacent to the mid thoracic esophagus suggestive of a foreign body, possibly a chicken bone (Figures 2,4). No active contrast leak was noted. No definite aorto-esophageal fistula was identified on the scan. The diagnosis of perforated esophageal foreign body complicated by mediastinal abscess and aortic pseudoaneurysm resulting in massive hemothorax was made. The patient was immediately shifted to the operating room but could not be successfully resuscitated. Ingested foreign bodies impacted in the esophagus are commonly encountered. Serious complications arising from ingested foreign bodies are, however, rare. Esophageal penetration caused by accidental swallowing of foreign body is unusual, with the reported incidence being 1% to 4%.1 Nandi et al reported that among 2,394 cases of foreign body ingestion, only 25 (1%) of patients had esophageal perforation caused by ingestion of ﬁsh or chicken bones, and two of these patients developed aorto-esophageal fistula.2 They found a wide variety of objects retained in the esophagus, but fish bones were the most common (60%) and chicken bones the second most common (16%). 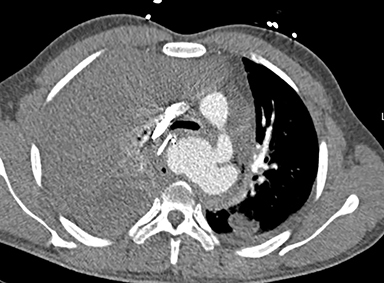 The patient usually presents with chest pain, pain on swallowing, sentinel hematemesis, and massive upper gastrointestinal hemorrhage5,6 secondary to aorto-esophageal fistula. In our case, the patient presented with sudden collapse due to rupture of the pseudoaneurysm and massive hemothorax. Foreign bodies in the esophagus can occasionally result in complications. 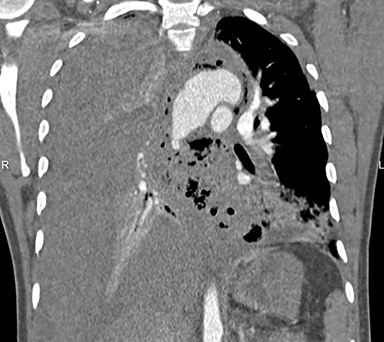 A rare complication is aortic pseudoaneurysm secondary to mediastinitis, which can have catastrophic consequences. Scher RL, Tegtmeyer CJ, McLean WC. Vascular injury following foreign body perforation of the esophagus: review of the literature and report of a case. Ann Otol Rhinol Laryngol. 1990;99:698-702. Loh KS, Tan KK. 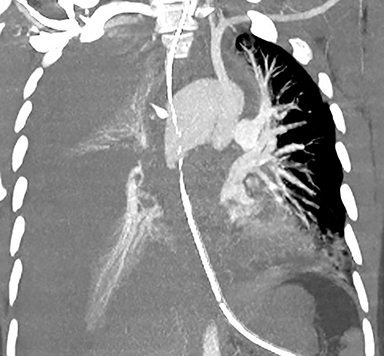 Subclavian-oesophageal fistula as a complication of foreign body ingestion: a case report. Ann Acad Med Singapore. 1998;27:277-278. Sharland MG, McCaughan BC. Perforation of the esophagus by a fish bone leading to cardiac tamponade. Ann Thorac Surg. 1993;56:969-971. Skinner DB, Little AG, DeMeester TR. Management of esophageal perforation. Am J Surg. 1980;139:760-764. Hunt I, Hartley S, Alwahab Y, Birkill GJ. Aortoesophageal perforation following ingestion of razorblades with massive haemothorax. Eur J Cardiothorac Surg. 2007;31:946-948. Sia KJ, Ashok GD, Ahmad FM, Kong CK. Aorto-oesophageal fistula and aortic pseudoaneurysm caused by a swallowed fish bone. Hong Kong Med J. 2013 Dec;19(6):542-544. Chen AP, Yu H, Li HM, Xiao XS, Liu SY. Aortoesophageal fistula and aortic pseudoaneurysm induced by swallowed fish bone: a report of two cases. Cardiovasc Intervent Radiol. 2011 Feb;34 Suppl 2:S17-19. D’Costa H, Bailey F, McGavigan B, George G, Todd B. Perforation of the oesophagus and aorta after eating ﬁsh: an unusual cause of chest pain. Emerg Med J. 2003;20:385-386. Marco De Lucas E, Sadaba P, Lastra Garcıa-Baron P, Ruiz-Delgado ML, Gonzalez Sanchez F, Ortiz A et al. Value of helical computed tomography in the management of upper esophageal foreign bodies. Acta Radiol. 2004;45:369-374. Ahmed MN, Nabir S, Ahmed Z, MD; Hilli SAAA, Ravikumar V, Momin U. Aortic pseudoaneurysm caused by ingested foreign body. Appl Radiol. 2017;46(9):32-34. Prepared by Drs. Mohamed Nadeem Ahmed, Nabir, Zahoor Ahmed, Al Hilli, Ravikumar, and Momin while Radiologists at Hamad General Hospital in Doha, Qatar.